Wasp identification guide - species and habitat. Wasps are generally seen as a benefit to the environment. As predatory flying insects, wasps are a great source of organic pest control on gardens, farms, and crops. Wasps are not domesticated; humans typically dont work with wasps like they do honeybees and stingless bees. Commonly two types of wasps species exist: Solitary wasps and Social wasps. Social wasps live in large numbers. Wasp nests are abandoned in late autumn, the queens individually over-winter until spring. Wasps eat meaty things, including spiders and sweets. Wasps can be more hot-tempered than bees, they are to be treated with caution. If you’re trying to eliminate nuisance wasps attached to your home or near an entryway, it is best done at sunset or very early in the morning. Wasps found inside the house may indicate a nest is living in the chimney or attic. How to get rid of bees. Below are pictures, identification, and habitat info, of common species of wasps that live within the U.S.
Up to 5,000 members per nest. Nests have multiple layers. Most of the US, and in Canada. Yellow jackets are sometimes called meat bees, sweet bees, or ground bees. Often mistaken for honeybees, yellow jackets are a little quicker, more slender, and are brighter yellow vs. the orange color of honeybees. Yellow jackets do not forage on flowers, and do not carry yellow pollen on the back of the legs. Yellow jackets can also be identified by a rapid side to side flight pattern prior to landing. They make great scavengers, eating meats, sweets. Yellow jackets are occasionally found in parks disrupting picnics or other events. The entry of a yellow jacket nest is a golf ball to softball size hole in the ground. yellow jackets defended their home very aggressively. Yellow jackets can sting repeatedly, they do not lose their stinger like a honeybee does, and thus do not die after stinging. Stings often cause a swelling reaction followed by itching for a few days. Like wasps & bees, yellow jackets sting only in defense or by accident. Nests start out very small during springtime, then growing larger toward winter. Colonies can reach a large size size of 4,000 and 5,000 workers by August or early September. At wintertime nests are abandoned, then in the spring, individual queens commonly return to areas nearby to survive their species. Occasionally yellow jackets nest in wall voids and attics, they can end up by accident in the house in large numbers. This is usually preceded by a noticeable slow growing wet spot on the ceiling caused by the yellow jacket nest. Every so often, a curious homeowner will poke or push their finger right through the deteriorating wall and end up with the unfortunate surprise of getting stung or chased. Buzzing from the nest can often be heard in the wall, though that would more commonly be a beehive. It’s generally considered unwise to try DIY bee removal on an active yellowjacket nest, hornet nest, or beehive without experience. 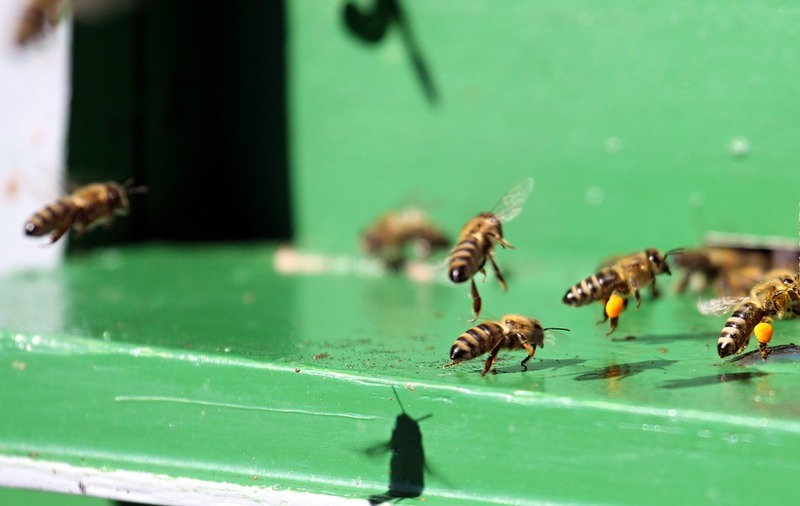 Learn more regarding how to keep bees away. Unlike honeybees that live year round, yellowjackets abandon their nest by late autumn. Yellowjackets like wasps, hornets, bumblebees, and carpenter bees, all abandon the nest by late autumn. During winter Yellowjacket queens will often hibernate structural voids and in attics until early spring. If you have un-wanted yellow jackets in your attic, to discourage them returning, in the winter you can put up some chemical cards labeled for yellowjackets. If you need help call the bee removal hotline. Have up to 700 members per nest. Hornets are most common in the US north east region, and in Canada. Hornets or bald faced hornets are commonly identified as black with white stripes, and also as black with yellow stripes. A hornet may look similar to the shorter, more slender yellow jacket, hornets being near twice as long as a yellowjacket and also thicker/more bulky then a yellowjacket . Like yellowjackes, hornets are not fuzzy they are shiny. Hornets may behave slightly less aggressive than yellow jackets. 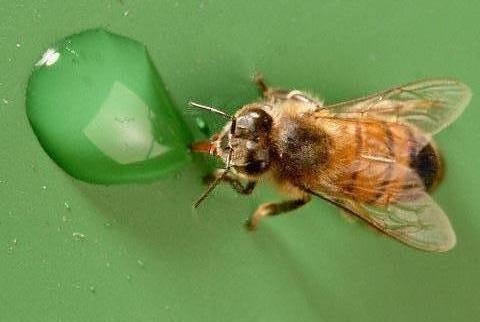 Hornets and wasps can sting multiple times having a painful sting. Hornets build randomly shaped nests from football to basket-ball or larger in size. Hornets can be found on tree branches, hallows, bushes, as well as houses and buildings, within attics and wall voids. When attached to a structure, or located in a problematic area Bee removal is commonly desired. Like most wasps and bees, hornets are defensive to anything within a close distance to the hive, or nest. Like wasps, hornets eat meaty things & sweets. Hornets are considered a natural organic form of pest control to gardens and crops. It’s generally considered unwise to try to remove a active hornet nest without experience. Like wasps, hornets abandon the nest in late autumn; the queens overwinter and may return to the same or a nearby location the following spring to build a new nest. If you have recurring hornet problems visit how to keep bees away. 3/4 to 1-1/2 inch long. Nest sizes generally consist of 5 to 30 wasps. Most common in West and South east regions of the US and bordering Mexico. Paper wasps are long with yellow and rusty brown or black stripes. 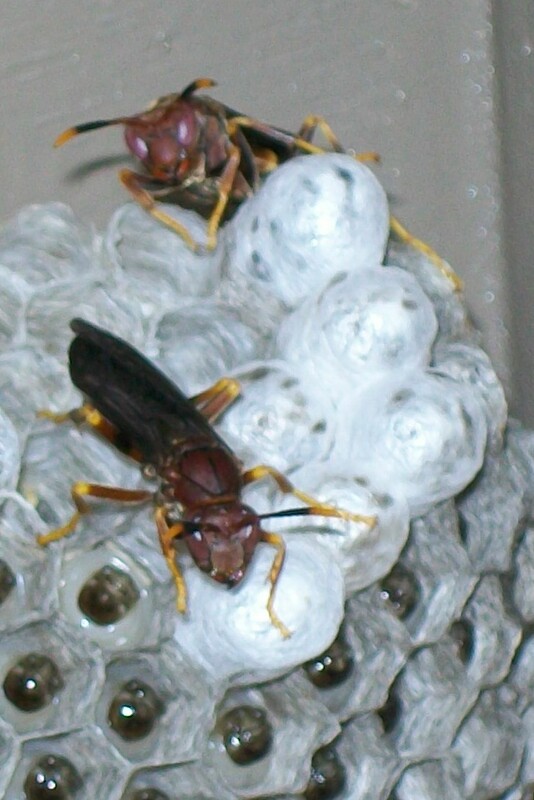 Paper wasp nests can be identified out in the open and under the eave structure of the roof-line.Nests a gray paper-like material honeycomb shaped, with larger nest sizes approaching the size of a tennis racket containing up to 50 wasps per nest. Paper wasps can be confused with hornets being similar in shape & size, though hornets typically have much larger hives and build nests within enclosed structures as well as non-structurally. Paper wasps are often found hanging under the eaves, though also found in attics, trees. Paper wasps attack when the nest is disturbed or aggravated, they have a painful sting; paper wasps can sting multiple times and do not lose their stinger, same as most wasps though unlike honeybees that can loose the stinger. Occasionally paper wasps are found inside the house. This happens when a nest is living in the attic, they end up lost and inside the house perhaps though a ceiling fixture were light is entering into the attic. In this case the wasp goes to the light planning to get back outside though ends up in the house; once inside wasps can navigate much better then honeybees, Wasps will typically hover around looking for an exit, while honeybees simply head strait toward the window or light. As shown above, three common types of Mud Wasps exist: mud daubers, potter wasps, and pollen wasps. These mud wasps construct their homes from mud and clay. They are also a health form of organic pest control to gardens and crops. Mud wasp species are typically found in surrounding areas of each other. Mud wasps commonly nest on walls, in attics, under bridges, and in the ground. Mud wasps are solitary wasps varying in size from 1/2 inch to 1-inch with relatively small nests. Prior to winter they abandon the mud nest, overwintering until spring time. At springtime mud wasps (like most wasps) often return to places of familiarity to build nests and carry on their species. Small nests, perhaps 3 to 20 wasps with tube-like cells. Mud daubers have a very compressed alien like look with a skinny needle like waist, they are sometimes called thread wasps or dirt daubers. Mud daubers are commonly identified by their hardened oval and tube shaped mud nests. Mud daubers nests rang from the size of a small peanut to the width of lemon. The mud dauber species seldom sting and are not protective of their nests. Mud daubers typically attach under eaves, porches, walls and attics. Mud daubers prey on all types of spiders including black widows. Potter wasps are located in the South East and West. Sometimes called mason wasps, potter wasps build pot like or jug shaped nests smaller than a lemon. Of all wasp species in existence, potter wasps have the largest diversity of species classified into some two hundred groups as shown in wikipedia: potter wasp species. Smaller than average nest size. Pollen wasps are actually similar to many solitary bees. Feed their young entirely on nectar and pollen from flowers. Pollen wasps are sometimes mistaken for yellow jackets because of size similarity and because they burrow nests in the ground; however pollen wasps can be identified by their large clubbed antennas and are much less aggressive. Rocks or crevices low to the earth make attractive nesting sites for pollen wasps. Sometimes wasps are mistaken for bees. Visit this bee identification chart to learn about the most common types of bees. Many types of bee species exist. Can't find what type of wasp? Upload a photo.